Hillary Clinton, in trying to say something nice about the late First Lady Nancy Reagan, instead said something highly inaccurate. During an MSNBC interview Friday, Clinton praised Reagan for her HIV and AIDS work, when the Reagan administration was notoriously slow and detrimental to fighting the disease early on. Look, it’s nice to romanticize people when they’ve passed on, but it’s much better to be accurate when describing their strengths. Nancy had a good record urging support for Alzheimer’s, something from which her husband suffered. However, when it came to the Reagans’ relationship with the HIV and the AIDS epidemic, they were not so on point. In fact, their then-White House spokesman Larry Speakes poked fun at the staggering epidemic in the early 1980s, according to The Guardian. 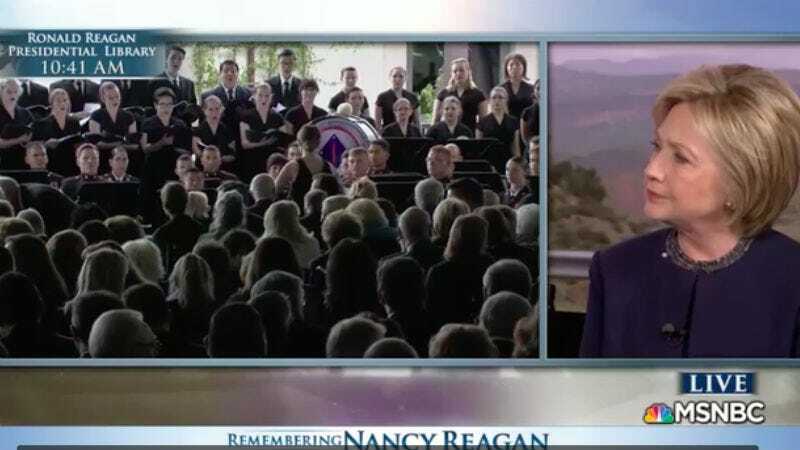 Meanwhile, scores of people, gay and straight, were becoming infected and dying, including the Reagans’ good friend Rock Hudson, whom Nancy reportedly turned her back on when he asked for help to secure treatment. In 1985, via BuzzFeed, Hudson traveled to France to try an experimental treatment called HPA-23—which wasn’t available in America—with a Parisian doctor. After arriving, he passed out at the Ritz Hotel before receiving treatment and his publicist asked the Reagan’s for a transfer to a nearby military hospital where a French doctor could see him. But after a commanding officer at Percy military hospital turned Hudson away because he wasn’t a French citizen, Mrs. Reagan didn’t step in to help her friend, who she’d known for decades from the couple’s Hollywood days. So, in a memorandum to Bill Martin, a special assistant to Reagan with the National Security Council, Weinberg then summarized the situation and his call with the first lady. “I spoke with Mrs. Reagan about the attached telegram. She did not feel this was something the White House should get into and agreed to my suggestion that we refer the writer to the U.S. Embassy, Paris,” he wrote at the time. Hudson was eventually admitted to the hospital but he died weeks later—and this was a friend of the Reagan’s. And as for the thousands who didn’t have a personal relationship with the First Family, years passed before President Reagan mentioned the epidemic publicly, let alone did something about it. One doctor named Marcus Conant, one of the first health professionals to diagnose and treat AIDS, told The Guardian he met with the Reagan administration in 1983 to request federal help. He was told by Reagan’s representative that it wasn’t a health issue as much as question of the law. Updated: Shortly after the segment aired, Clinton released this statement.